1776 – Thomas Hinkey was hanged for mutiny, sedition, and treachery for plotting to kidnap George Washington. Hinkey was one of his bodyguards. 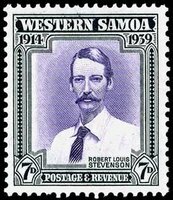 1888 – Robert Louis Stevenson and his family leave San Francisco for their first visit to the South Seas on this day in 1888. Stevenson, an adventurous traveler plagued by tuberculosis, was seeking a healthier climate. The family finally settled in Samoa, where Stevenson died in 1894.
audio • NPR’s Scott Simon reports on Rare map dealer Edward Smiley who admited to stealing millions of dollars worth of rare maps from libraries around the country. everybody limbo! • , depicting happy Cuban school children from the schools libraries, until all the lawyers have had their day in court. Happy schoolchildren! who ever heard of such a thing! bad words • on the other hand, the New Milford CT school board is removing a book about racial prejudice that has the audacity to use a racial slur in the text to make its point. more on that • Huntgsville Times Columnist David Prather who was once thrown out of school for reading smutty James Bond novels, muses on the never ending battle over books in the classroom. mitzvah • Educational Development Corporation, an OK children’s publisher has gifted the Bank of Oklahoma Book by Book literacy campaign with $10,000 worth of books. Those who love books will have the chance to get together and talk about them at 6:30 p.m. Thursday at the Clark County Library, 370 South Burns Avenue. Book Collectors Anonymous will feature Andy Gary, a book collector who will discuss collecting new and old books and give tips on where to find them and how to care for them. this news item from the Lexington Herald-Leader just tickled me no end, can you imagine if this sort of thing, catches on? ACTUALLY having people passionate about collecting books gathering in groups? who would have ever HEARD of such a thing! What if it caught on?